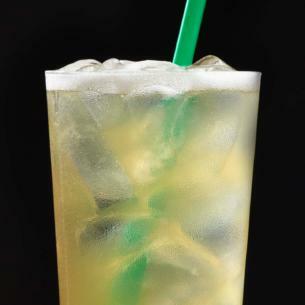 Ice, Lemonade [Water, Lemon Juice, Sugar, Lemon Oil], An Infusion Of [Water, A Blend Of Green Teas, Spearmint, Lemon Verbena, Lemongrass And Natural Flavour], Liquid Cane Sugar [Water, Turbinado Cane Sugar, Cane Sugar, Natural Flavor, Potassium Sorbate, Citric Acid]. Did you know? Lemons are believed to have originated in northern India several hundred years ago. Lemonade stands may have followed shortly thereafter.